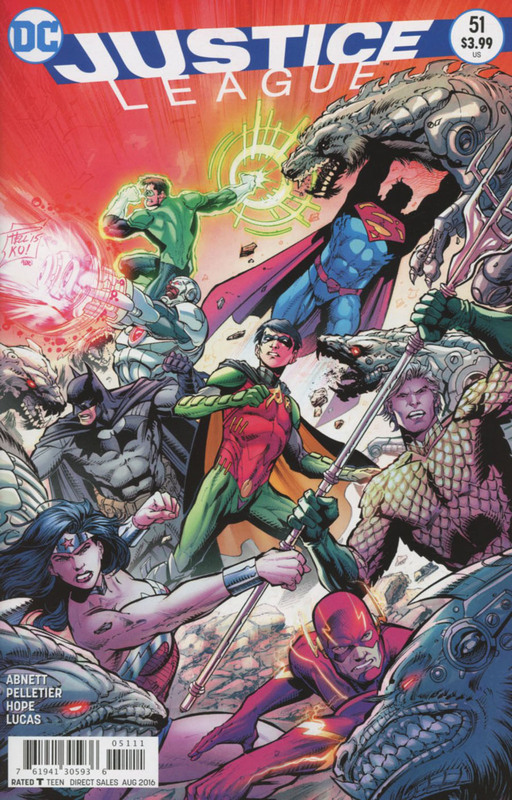 "Gods of Justice" - Chapter One: "Crime Pays"
Batman brings Robin to meet the Justice League in the midst of a crisis. Though he feels out of sorts at first, Robin is able to provide his own acumen to the situation, helping the League to be rid of their "Fortean" interlopers. Robin questions Batman's decision to bring him into such a fray, but Batman responds that Robin will not only be a member of the League one day, that he will also lead it. Story - 3: There is such a contrast here with this tale, and another Batman and Robin story making the rounds: "The Last Crusade". In Justice League, Robin is not only an asset, but the future. In TLC (Ha! ), Robin is a liability and a plot catalyst. DC Comics was the home of the child superhero, until DC decided that "DC Comics Aren't Just For Kids!" applied so much realism that they took child endangerment seriously for their fictional creations, and had a 900-number allowing Robin to be killed. This installment shows the viable nature of not just the hero with meta-class powers, but also the child hero as well, if shown the same respect. Examine Cyborg's interaction with Robin. He doesn't condescend or ignore Robin, but explains that if Batman brought him, then Robin, as a hero, must have value. Robin is given a chance to fulfill that worth with his training and intellect, and that is reinforced by the Batman's last words on the matter. Had this story actually happened five years ago, DC Comics would be a better place. Better late than never, I supposed. Art - 4: Pelletier's line is reminiscent of Davis, Finch, and Frank. I'm not sure how he's achieving it, but he's getting it done. Cover Art - 3: Dullsville for the most part, but thankfully the interior is much, much better.